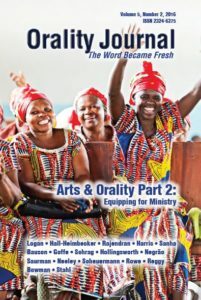 ICE has collaborated a second time with the International Orality Network to produce a volume of the Orality Journal dedicated to equipping people to engage local arts in oral contexts. You’ll find articles and pictures from many ICE members and other ethnoarts proponents, artists, and scholars working around the world. If you like this material, check out Arts & Orality Part 1: Applications and Foundations, too. Previous post Welcome to the new ICE website! Next post New ICE Website Receives Award!